Virgin Trains has started court proceedings over the government's decision to award a new franchise to rival transport company FirstGroup. Virgin has run the West Coast Main Line since 1997, but lost to FirstGroup, prompting it to demand a review. Labour had also urged the government to defer signing the contract so that MPs could examine it. 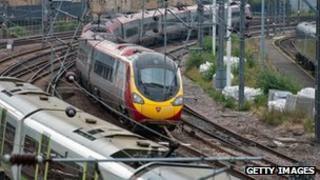 Transport Secretary Justine Greening earlier said there would be no delay but Virgin hopes for a pause. It is unclear if or for how long the legal action would halt the process, with the contract due to be signed on Wednesday. Virgin's legal challenge is an application for a judicial review of the decision to award FirstGroup the contract, and has lodged papers at the High Court in London. Sir Richard Branson, the founder of Virgin Group, said: "In the bid process the one thing we do know is our bid was voted far more deliverable than FirstGroup's. "All we are saying is that these same civil servants got their maths wrong with National Express and GNER, we're absolutely convinced they've got their maths wrong with FirstGroup. Media captionSir Richard Branson: "We have major questions we would like to see answered"
"Rather than give up the fight as we did on the East Coast Main Line, we're going to fight, and if at the end we're proven wrong we'll bow out gracefully." Mrs Greening said she was disappointed by Virgin's decision to start legal action. "We will defend the robustness of the process. It's a process that Virgin themselves have been involved in for the last 15 months and have raised no concerns about until the point it became clear that they had lost this bid," she said. "We have a process that all the parties bought in to, one of them that hasn't won out on the bid has chosen to challenge it." Virgin said it was going to the High Court in the hope that the process would be declared flawed. However, FirstGroup said in response: "We have every confidence in the DfT's [Department for Transport's] process which is rigorous, detailed and fair and in which bids are thoroughly tested. "There has been no complaint about the process, which was carefully described in advance, until Virgin Rail Group had lost commercially." FirstGroup said it wanted to proceed "without delay or disruption" and would continue to prepare to start running the franchise on 9 December this year. A DfT spokesman added: "We are confident our process is robust and that the decision was absolutely the right one for tax payers and passengers. We expect to sign the contract soon." Virgin Trains said a clause in the invitation to tender for the franchise stated that the DfT should not sign the contract if a legal challenge was received. In a statement, Virgin said it had tried to get clarity over the DfT's decision, but its questions had been unanswered for three weeks. "We are left with no choice but to commence court proceedings as we believe the procurement process has ignored the substantial risks to taxpayers and customers of delivering FirstGroup's bid over the course of the franchise." It added: "The current process is geared to selecting the highest-risk bid and needs to be independently audited to prevent a repeat of former franchise failures." More than 150,000 people have signed an online petition calling for the decision to be reconsidered. In a letter to Mrs Greening, shadow transport secretary Maria Eagle said FirstGroup's bid was "significantly higher than any other bid" and the decision seemed to be "almost exclusively a 'bottom line' one, driven by a particularly high pledge of payments to government". FirstGroup is due to take over the franchise, under the name First West Coast Limited, until 2026. The Aberdeen-based company already operates a number of rail routes, including Great Western and ScotRail. The West Coast Main Line route serves 31 million passengers travelling between London, the West Midlands, the North West, North Wales and the central belt of Scotland. Passenger numbers have doubled since Virgin started running the franchise. FirstGroup has said it would introduce 11 new 125mph six-car electric trains on the Birmingham to Glasgow route and provide more direct services between destinations, as well as introduce improved wi-fi and food.